Yes, comments have been disabled for the whole blog. It just looked so nice I didn't want to dirty it up. That being said, I know so many of you will want to express yourselves that I've created this ONE post with moderated comments enabled so bring on your best comment or worst flame, but, keep it clean or I'll delete it. Now you got me curious: right when the Lights, Camera, Action sequence is finished, there is a voice that says "Make Your Selection Now". Might this be one of the developer's voices? KungFuFurby, I met with the rest of the original Action 52 developers yesterday, quite an afternoon, I'll be blogging about it in the next few days. In any case, we agreed the voice of "Make your selection now" was the voice of Mikey C. He was the man who owned the music studio\cave we worked in. Mario and I had known him for years before that because we recorded a Miami dance single at another of his recording studios years earlier. That is an excellent question. I can tell you for sure it was not me. And, with good certainty, it wasn't any of the other 3 guys as none of them sound anything like that. If it was any of us it would've been Nelson but his voice doesn't sound like that either, at all, but, he could've manipulated it digitally. I promise as soon as\if I find out I will post the answer to this mystery. Thanks for your post ! Have you guys seen the Angry Video game Nerd review of action 52 and Cheetahmen on youtube? what are your thoughts? Hi Huckabee, thanks for your post. I've seen the review and I'm pretty sure the rest of the developers have as well, probably everybody in retro\vintage gaming has. I think everyone is entitled to their opinion and bottom line the more exposure Action 52 gets, negative, or positive, or neutral, the more awareness there is for this classic game and retro\vintage gaming in general. There was also an Action 52 release for the Sega Genesis console...From what one understands, this version also had 52 games but was produced by different people and some of the games were different. 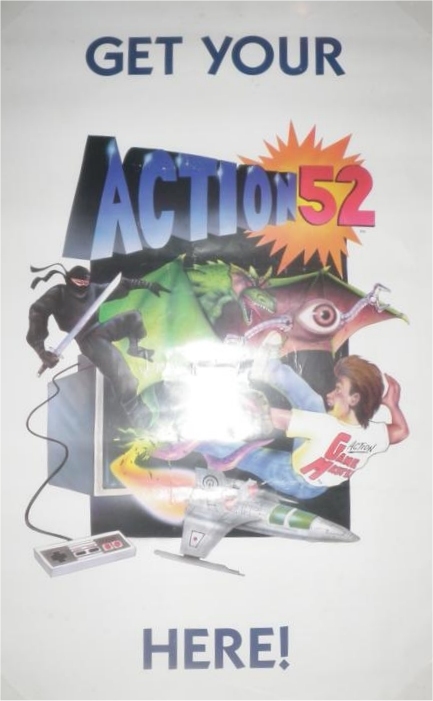 One similarity was that the Sega Genesis release of Action 52 was not licensed by the console manufacturer. Keep it clean. Inappropriate comments will be deleted !